This blog post is my attempt to group together the issues and collate some of Hammer’s responses to date. (And please note: as of 2016, some of the links point to the Internet Archive, as the original pages are no longer on the active web.) Before I begin, here’s a tale that’s possibly related to some of the issues I’m about to document. Back in February, I attended a screening of the restored Dracula (ie, the version of the film featuring the recently discovered Japanese footage), at the Vault Festival in London’s Old Vic Tunnels. Throughout the screening, the audio sync appeared to be a few frames out. Afterwards, on the British Horror Films board, another audience member confirmed that he’d noticed it too. 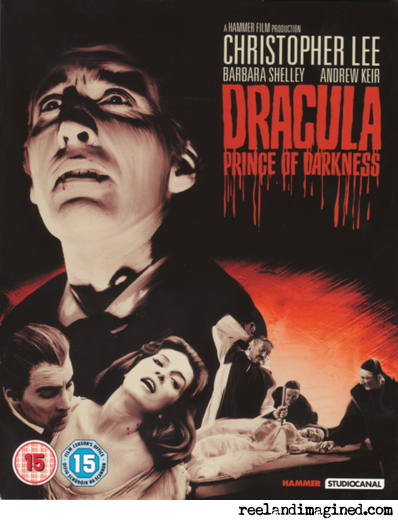 Released on BD (and, like all these releases, accompanying DVD) in March, Hammer’s 1966 Dracula sequel had been on sale for less than a day when some buyers reported that the audio sync was askew in various scenes – sound effects were adrift in places, notably in the reprise from Dracula at the beginning of the film and during the famous resurrection scene, and lips were flapping loose as the weary travellers entered the castle. The news came completely out of the blue, as none of the pre-release reviews had flagged up the issue. Replacement discs, both BD and DVD, were indeed issued to buyers who emailed them a proof of purchase. Stock was also withdrawn from online stores and the set was reissued in April. Anyone buying the set now should receive the new discs. These not only have corrected audio but the picture has also been tweaked, with an improved encode applied to the film’s opening scenes. Here Hammer listened to the reviews and fans’ opinions, and took the opportunity of the recall to do some bonus tinkering, which was, I think, generally well received. Still a problem on the revised discs, though, is the documentary, Back To Black, which uses many scenes from the main feature without, apparently, resolving the difference in frame rates between the film clips and the talking heads, etc. The result is that whenever a clip of the film plays within the documentary, it appears to pause for an extra frame every second, giving a jerky effect that’s especially noticeable on panning shots. There’s a particularly strong example of the effect at 20m 55s on the BD (20m 51s on the DVD), as the camera pans down from a sign to a coach. It’s hard to miss, and therefore a mystery how it made it to store shelves – though fans were understandably more concerned with getting the film itself fixed up, and no one seems to have flagged up the issue with Hammer, at least not publicly. After the problems with Dracula Prince Of Darkness, confidence in Hammer was high. The original release had audio errors, but the company had handled the situation well, and lightning couldn’t strike twice, could it? Quality control would surely be fantastic from here on in. Yet when The Plague Of The Zombies was released in June, some buyers complained of problems with audio sync. I was one of those complainants, and while I’m happy to acknowledge that the issue isn’t as immediately obvious or as drastic as it was on Dracula Prince Of Darkness (to get the full effect, I recommend a comparison with the old DVD), I continue to be surprised that it hasn’t been more widely noticed or reported. The sync slip is most noticeable in two scenes: early in the film when André Morrell and Diane Clare pay Jacqueline Pearce a visit, and later when John Carson drops in on Diane Clare to steal some of her blood. This reviewer was clearly seeing what I was seeing. Hammer said on its blog that it had been unable to see the problem and had surmised that it was therefore a player issue. Yet I’ve tried the DVD in four different players, and the BD in two players, and the sync issues remain. It’s a fair question, and Hammer has suggested on its restoration blog that what people are seeing might actually just be dodgy dubbing in the original film. I really don’t think that this is the case, though, as the sync in these scenes is definitely much tighter on the old DVD. Of course, everyone has different tolerances with this stuff, and I own up to being particularly sensitive to matters of sync. If you’re anything like me you’ll find The Plague Of The Zombies’ issues easy to spot without trying and irritating enough to spoil the scenes that they affect. If you’re not anything like me, well, I’m envious – in so many ways. But ultimately sensitivity to these issues shouldn’t matter. When it comes down to it, the sync is either correct or it’s not. ‘Out but not by much’ is still out, and this release is supposed to be the best presentation that this film has seen on home formats. I was disappointed. One commentator on Hammer’s blog was “quite heart broken actually as it’s my fave Hammer”. Ouch. Minor issue or not, it’s astonishing to me that this release has any kind of sync problems after what happened with Dracula Prince Of Darkness. Finally, the film clips in the documentary again suffer from stuttering motion. 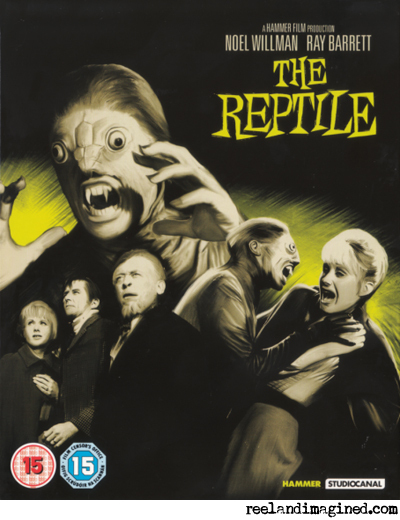 With The Reptile, the film itself plays fine, but the clips in the accompanying documentary… ah, you know the rest. 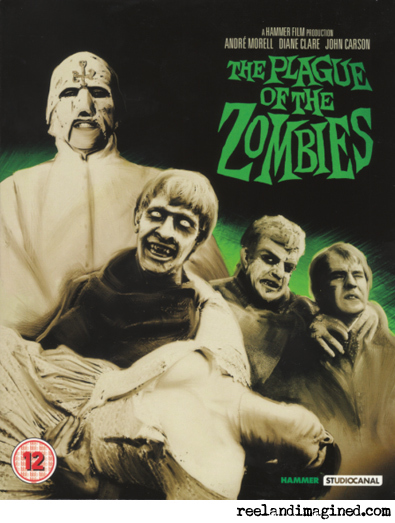 This set was released on the same day as The Plague Of The Zombies, so it makes sense that its documentary would suffer in the same way. This time a few people, including me, filed reports about the problem on Hammer’s restoration blog and hoped for the best next time around. The first restored Hammer film from Lionsgate, The Curse Of Frankenstein was released under a cloud of controversy regarding its aspect ratio. After studying the film, Hammer said that it appeared to have been shot for 1.37:1, so it made this ‘never before released’ version the main feature on the disc, with the 1.66:1 version included as an ‘alternate’, which got some fans’ backs up. And when screenshots appeared online alongside an early review, a fierce debate began about whether or not the widescreen version had been misframed. Hammer posted its side of the argument on its restoration blog, while the comments section attracted some of the counter-argument, as well as links to various documents pertaining to the subject that were unearthed via the mammoth ‘aspect ratio research’ thread on the Home Theater Forum. Hammer archivist Robert JE Simpson contributed a blog of his own, too. Read it all, if you have the stamina, and make up your own mind, as this debate is sure to run and run. For what it’s worth, framing-wise, I’m happy with both versions of the film as presented on the new BD. What I’m far less happy with is the picture quality. The restored version of The Curse Of Frankenstein premiered back in July in Leicester at the Hammer Has Risen From The Grave festival, which I attended. Before the screening, Hammer’s Nic Ransome said that the first thing we’d probably notice was the softness of the picture – a statement that seemed designed to prepare us for a disappointing restoration. He went on to say that the film was restored from the same elements that the old US DVD had used, a fact confirmed by a blog that Hammer later posted on 17 October. Though colour on the restored film is quite vivid, faces appear bleached and the image is indeed quite soft. It’s also plagued with flicker, which hits some scenes especially hard, most notably early in the film when Peter Cushing and Robert Urquhart cut the dead body down from the gibbet, and in the later scenes in the woods. Compare the old US DVD, where the image is stable during these scenes (and elsewhere), with the new BD and the difference is striking. Thankfully, the new DVD appears to be less afflicted than the BD, which at least gives anyone who, like me, is driven to distraction by the flickering a chance to watch the new restoration without climbing the walls. Hi-def be damned. 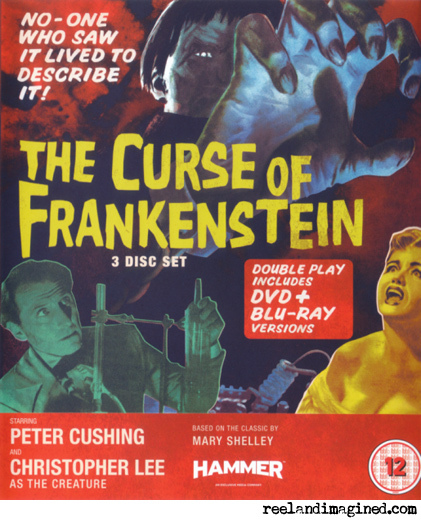 Pleasingly, the accompanying documentary, Frankenstein Reborn: The Making Of A Hammer Classic, is free from the stuttering that affected Hammer’s previous 2012 releases – the comments made on its blog over the summer about this issue appear to have been noted, and all subsequent documentaries play fine. Here’s where things get really weird, as Hammer has digitally tweaked the optical effects in The Devil Rides Out, a 44-year-old film, and only included this revised version on its much-anticipated BD release. The company didn’t even announce its intention – the first that most people heard of it was when reviewers started picking up on the changes that had been made to the film and spreading the word via forums and Twitter. Even more curious is that nowhere on the set’s packaging does it say that the film has been revised in this way. “Fully restored and on Blu-ray for the first time” runs the banner on the back, a little disingenuously. The revised effects appear throughout the film. Water droplets have been added to the demise of the spider, while swirling smoke accompanies the appearance of the genie. The lightning strike at the film’s climax has had a makeover, and outside shots of the house and observatory have a new cloudy sky. It’s the latter that I find the most incongruous-looking of the tweaked shots – to my eye they give themselves away immediately as having been created using modern filmmaking techniques. The two shots that caught the most immediate attention from fans involve the Angel of Death, who now makes his entrance bathed in white light, and appears in close-up with blue flames flickering behind him. Screengrabs of these revisions, alongside frames from the original film, appeared in a blog post from SFX’s Ian Berriman, who also shared his arguments against the updating of films. When the news of all this broke, people started contacting Hammer via Twitter. The company defended its revisions, saying that the film’s director, Terence Fisher, and its star, Christopher Lee, “were never happy w/ quality of original effects (ran out of budget). We have lovingly enhanced them”. This is true and widely known, and if the updated effects were offered as an option on the new release, alongside the original effects, there would have been no controversy at all. Still the company tweeted a series of replies, shrugging off criticism that they should have included the original film by urging people to: “Watch it and get back to us”, “Watch it then let us know what you think”, “Maybe watch it first, then decide what you think…”, “Again: watch it, THEN decide!”, “As we’ve said to everyone else: watch it before you opine!” and… well, you get the idea. This line of response ignored the point that people were making, which had nothing to do with how good the revisions might or might not look. Some of Hammer’s other replies suggested that people hang on to their old DVDs, the product that this new set was meant to usurp: “Unrestored version still widely available btw”, “But you still have the choice of either version! How many Hammer fans don’t have the DVD in their collection?” and “The unrestored original still exists in everyone’s collection so option remains to watch it”. The Curse Of Frankenstein and Rasputin The Mad Monk both offer two different versions of the films on their BDs (a choice of aspect ratios), so disc space surely can’t have been an issue. What else might the problem have been? 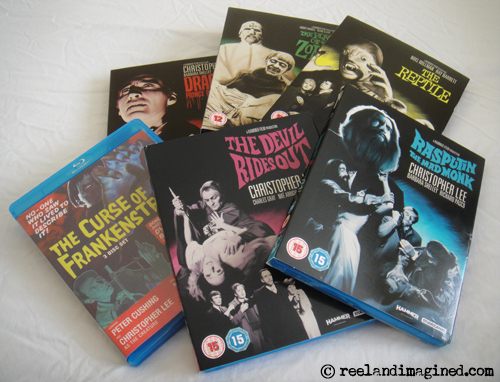 Why was it “not as easy” to include two versions of The Devil Rides Out? We’re still waiting for that blog post. In the meantime, here’s another log for the fire: one of the scenes in the new version of the film appears to have been misgraded, or at least overlooked. 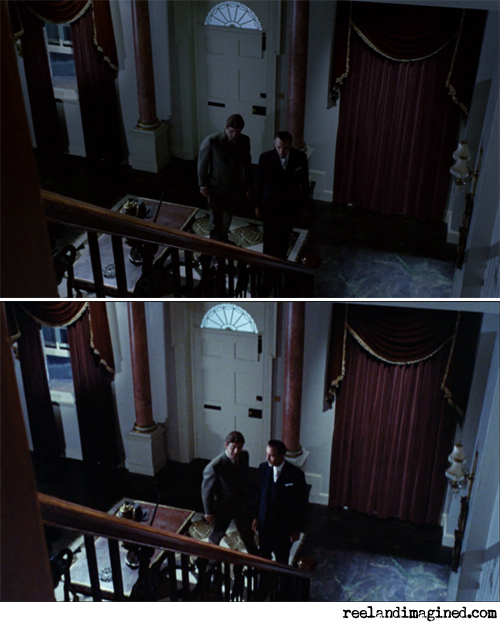 Beginning around 18m 10s on the BD (17m 28s on the DVD), when Christopher Lee and Leon Greene enter through the window and talk at the foot of the stairs, there are two long shots separated by a medium shot. The second long shot is much brighter (and grainier) than the first one, making it look like someone has switched on a light in the middle of the scene. On the old DVD, the colour and lighting of the two shots match, as of course they should. The screengrabs from the new DVD that I’ve posted on the right demonstrate the differences (click the image for a larger version), though the effect is even more pronounced on a TV screen. So, if this bothers you, there’s another reason to hang on to your old release. 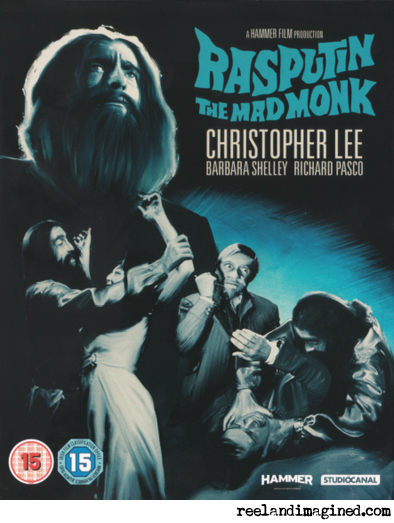 Many buyers of Rasputin The Mad Monk, including me, are dissatisfied with the audio quality, which pales in comparison with the old DVD from 2006. Writing reams about this seems a waste when the differences between old and new releases are easily demonstrable. Click play on the widget below and take a listen – audio from the old DVD is followed by audio from the new DVD, which has a similar sound to the new BD. In case it needs saying, all of these releases have their good attributes, and in most cases those attributes are much more than good – they’re splendid. With the exception of The Curse Of Frankenstein, hi-def picture quality is great across the board, and the films come with some lovely extras: brand-new documentaries, commentaries from actors and experts, bonus films and more. I don’t doubt that many hundreds of hours have gone into these releases, nor that the people behind them are sweating buckets to bring them to fruition. It’s not that I don’t appreciate the good things about these sets – I do – but I’m also disappointed by the bad things. These versions of the films are meant to be definitive, and much better than anything we’ve had before, so I’m naturally frustrated by the areas in which they aren’t. As it stands, if I want to enjoy The Plague Of The Zombies with tight audio sync throughout, I have to watch my old DVD. 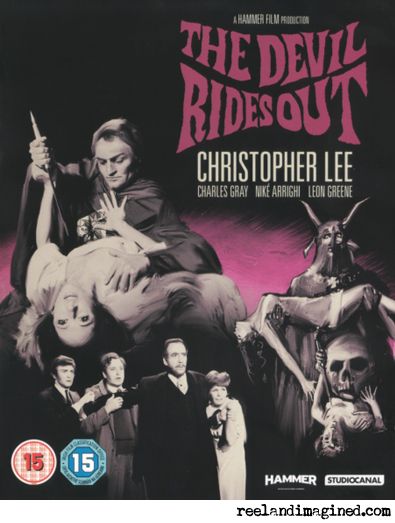 If I want to see The Devil Rides Out with its original effects, I have to watch my old DVD. If I want to watch Rasputin The Mad Monk with the best available soundtrack, well, yes, I’d best pop on the old DVD. The Curse Of Frankenstein without maddening flicker? That’s the Blu-ray off the menu. “Watch it and get back to us,” said Hammer. Here you go, say I. All of the A/V problems I’ve noted in this article are things that I spotted on my first viewing. I didn’t sit down to study these discs and tear them apart – I put them on purely for entertainment and found myself raising an eyebrow at what to me were obvious flaws. I can’t stress this point enough. A common rebuttal to criticism of these releases is that the viewer is obsessively nitpicking or appearing ungrateful, which doesn’t address any of the observations that I and others are making, and would only really make sense if the sets were being given away. For £16, customers have the right to say what they see and point out when certain aspects of a trumpeted Blu-ray restoration are, in their opinion, worse than previous DVDs. Feedback led to a recall and repair for Dracula Prince Of Darkness. It also appears to have been responsible for ensuring that the frame-rate issue that marred documentaries on the early releases didn’t affect more recent ones. Next year’s crop of releases is set to include Dracula and Frankenstein And The Monster From Hell. Needless to say, my fingers are tightly crossed. 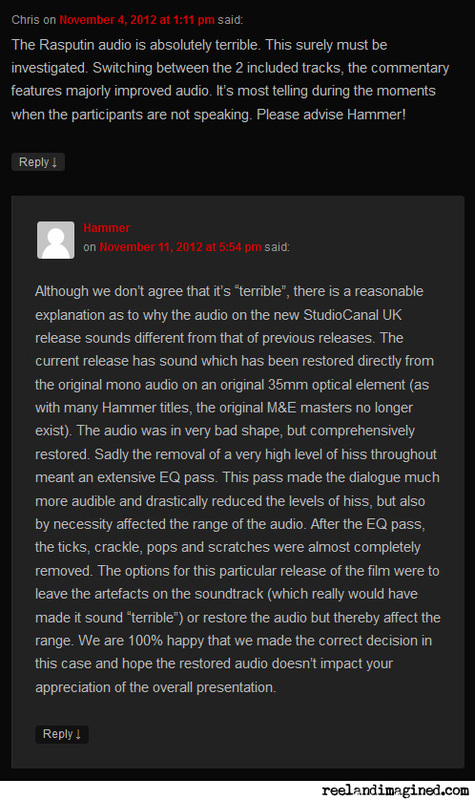 Hammer has responded to criticism of Rasputin’s audio on its restoration blog, in reply to a comment from 4 November that called the audio “absolutely terrible”. “Although we don’t agree that it’s ‘terrible’,” said Hammer, “there is a reasonable explanation as to why the audio on the new StudioCanal UK release sounds different from that of previous releases. “The current release has sound which has been restored directly from the original mono audio on an original 35mm optical element (as with many Hammer titles, the original M&E masters no longer exist). “The audio was in very bad shape, but comprehensively restored. Sadly the removal of a very high level of hiss throughout meant an extensive EQ pass. This pass made the dialogue much more audible and drastically reduced the levels of hiss, but also by necessity affected the range of the audio. In the same thread on Facebook, Hammer also responded to sync problems that some people reported seeing earlier this year at screenings in the Old Vic Tunnels: “The audio sync problems noted at the Vault Festival were entirely down to sound/picture projection issues due to Blu-ray sources and the pop-up nature of the cinema. For an up-to-date guide to Hammer Blu-rays, visit Roobarb’s Forum. There you’ll find a list of titles from all regions, along with any reported issues. What about Quatermass and the Pit? Is that Hammer’s only fault free release, and thus has been left off this run down? It’s just I’ve heard from a couple of places that the audio features newly recorded foley effects, especially at the end. Nick – that’s interesting; I wasn’t aware of any changes to Quatermass And The Pit. I’ll have a fresh watch to see whether I can see, or rather hear, anything. I think it’s a really good-looking transfer. I’ve not mentioned it in the article as the problems seemed to start with this year’s releases. The Mummy’s Shroud, released on the same day as Rasputin and The Devil Rides Out, seems to be fault-free and has so far escaped any controversy. Going further back, I recommend Paranoiac, released by Eureka in 2010. Another good-looking hi-def transfer. I watched Plague last night. Those two scene you highlighted are certainly out of synch, as are a couple of others. One was the one with the bereaved brother being questioned at the police station. Incredibly shoddy! Is there no quality control at Hammer or Studio Canal? Seemingly not. A year or so ao, the idea of so many Hammers on Blu-ray would have seemed amazingly exciting. After so many muffed discs, I’ve all but given up on the line. As for The Mummy’s Shroud, there’s a small video glitch at the 30 minute mark, when the girl recoils from translating the shroud. Thanks for the support with The Plague Of The Zombies, Ross. On the one hand, I’m glad that you can see what I mean. One the other, I’m sorry that you’re as bugged by it as I am. Having taken a close look at the scene you mention in The Mummy’s Shroud, I can see a single fuzzy frame just after the cut, but I only caught this on slo-mo. Are you seeing something worse? It’s a split-second bit of fuzziness, so probably the same thing. It’s certainly not on the Anchor Bay DVD. I noticed it on normal play as I viewed it; it just sort of jumped out at me. Unfortunately, by playing the old DVD to check I realised that the sound on that is a bit better than on the new BD. The BD is tinnier. It’s not particularly distracting, but odd that it should be worse not better. Interesting – cheers. I don’t own a commercially released version of The Mummy’s Shroud (just an off-air), so I’m unable to make any fair comparisons with what’s come before. For what it’s worth, I think that the audio on The Devil Rides Out BD is a bit thinner-sounding than the old DVD, but it’s something I only noticed by directly comparing the discs – it didn’t leap out at me the way Rasputin did. Something seems to have gone very wrong there. Thanks, John. I’ll add a postscript to this article soon, including these latest responses from Hammer. Can I just add that I thought the aspect ratio row on ‘Curse’ *was* a big issue. Not the inclusion of two ARs – fair enough – not even the alleged misframing of the 1.66:1 version, which is a puzzle, but small beer when compared to the condition of the transfer overall. No, my problem lay with the fact that on their blog and in *all* their publicity for the disc, Hammer insisted on calling the Academy ratio version, the ‘original aspect ratio’, which is clearly wrong. It’s not subjective opinion, it’s a matter of plain fact (as you say discussed interminably at the HTF and elsewhere), and Hammer are attempting to apply that label to a number of other ’50s Hammer films – again just wrong, wrong, wrong. I’ve seen some small attempts to back away from that initial position by Hammer, but they are quite obdurate and will not recant. Which is not only sad, but a distortion of their own legacy and British cinema history. John – strangely, The Curse Of Frankenstein’s packaging lists the “never before released Academy ratio” version and an “alternate 1.66:1 version”. If one has never been released before and the other is an alternate, it does lead to an obvious question. Oh, for sure. I was just amused that the actual product offered a previously unreleased version and an alternate version – though, reading the blurb on the back of the pack (as opposed to the contents), I do see the phrase “original Academy ratio”. So the claim is there as well. Personally speaking, I’m actually not too fussed about this particular issue, but I’ve been following the debate and I understand why you and others are passionate about it. Interesting blog, thanks for the rundown. As is the nature of the beast, each person (as you point out) has a different tolerence threshold for transfer issues and what drives one person nuts doesn’t faze another. I have to admit I didn’t see the sync problem in PLAGUE, and I’m usually quite sensitive to things like that having done QC jobs on video masters for different companies. My personal bugaboo, one you mention only in relation to DEVIL RIDES OUT, is the color timing on several of their releases. DPOD to me is unwatchable due to it’s green bias. And besides the brightness miscue on that one cut in DRO (which appears to be a dupe, judging by the drop in overall quality) there’s another a few minutes later, when they head for the stairs to the observatory. For my taste the whole transfer is too bright, which negatively impacts the atmosphere. Personally, I’ll most likely be sticking with the older dvd for future viewings, despite the obvious improvements in resolution on the blu. I thought PLAGUE looked quite nice overall, REPTILE was fine with the exception of the hideous dupe main titles, MUMMY’S SHROUD also very nice. RASPUTIN I haven’t seen, although those sound comparisons are pretty depressing. I know it’s not exactly cricket, but couldn’t they have lifted the audio from the AB dvd? With a little processing it would have yielded a much better result than what they ended up with. COF I only have had the opportunity to watch a few minutes of and can’t say I was much impressed. I’ll probably stick with the Warners dvd. I’m nervously waiting for DRACULA, and hoping they knock it out of the park since it’s my favorite from the studio. So Quatermass and The Mummy’s Shroud are the only titles so far that don’t have any issues? I’ve read a few criticisms of those titles (some are mentioned in the comments section here), but I’m pretty happy with them.